UPDATED June 14, 2018, 3:00 p.m.
On June 3 Guatemala’s Volcán de Fuego, or “Fire Volcano” erupted. 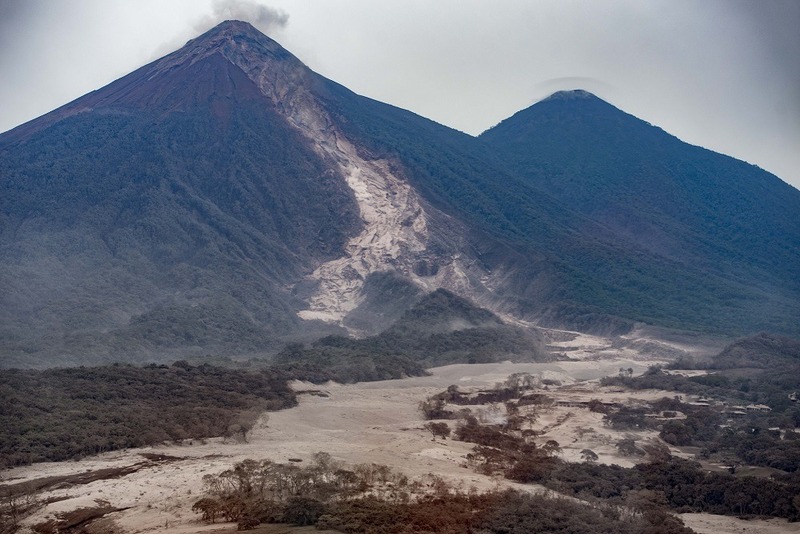 The volcano, which sits 27 miles southwest of the capital, Guatemala City, is part of the seismically-active Pacific Ring of Fire. Kilauea on the Big Island of Hawaii, which began erupting last month, also sits in this seismically-active path, but the two eruptions look very different. Unlike the slow oozing of lava from Kilauea, Volcan de Fuego’s explosion created what are known as pyroclastic flows — extremely hot, fast-moving clouds of gas and volcanic matter that have killed at least 110 people. Guatemala’s Fire Volcano has since increased its activity, with some of the strongest explosions throwing ash more than three miles into the air. Many areas that were buried under ash and debris are still inaccessible, which means the death toll will likely continue to rise. According to the most recent situation report from the UN Office for the Coordination of Humanitarian Affairs (UNOCHA), over 1.7 million people in Guatemala have been affected and 12,823 people have been evacuated so far. 3,557 people are officially sheltered and 197 individuals have been reported missing. Food security and economic recovery will be a major priority after immediate needs are met. UNOCHA reports that people in the affected areas mostly work in factories and farmland in the south. The crops they cultivated, mostly corn and bean, were primarily for their own consumption, and these have nearly all been wiped out. In an area of between 7,000-8,700 acres near the volcano, losses also include about 2,700 tons of coffee, equivalent to 1.27 percent of Guatemala’s coffee export for 2018-2019. Eruption of Guatemala’s Volcan de Fuego, June 4, 2018. Photo courtesy of CONRED Guatemala via Flickr (CC BY-NC-ND 2.0). The following Global Washington members are responding to the communities affected by this volcanic eruption in Guatemala. These organizations are accepting donations directly, or you may donate to the Global Impact fund for Guatemala Volcano Relief. Americares has been providing assistance to Guatemala since 1986, supporting a network of hospitals, clinics and homes for children and the elderly through its longstanding partnership with the Order of Malta. Americares is preparing an emergency shipment of medicine and relief supplies – sixteen tons of supplies – including antibiotics, wound care supplies, hygiene products and medicine for acute and chronic conditions, which will be distributed through the Order of Malta to shelters for evacuees. CARE which has worked in Guatemala since 1959, has been actively working in the volcano’s impact zone, assessing needs and supporting affected families. The organization’s initial assessment identified immediate needs including food, water, and sanitation, as well as violence prevention, with a particular focus on women and girls, who face increased risks in crisis situations. In the days ahead, CARE plans to closely assess the particular effects of the disaster on women and indigenous minorities and adapt its response strategy accordingly. Mercy Corps has been working in Guatemala since 2001, focused on strengthening local violence prevention initiatives, providing nutrition education to mothers with young children, helping small-holder farmers diversify and improve the quality of their crops, and providing health and hygiene education. In response to the latest emergency, Mercy Corps has been coordinating with local authorities to distribute 1,500 gallons of purified water to evacuees. Further aid efforts are being assessed. The Starbucks Foundation announced on Tuesday, June 12, that it has donated $100,000 to support CARE’s ongoing relief and recovery efforts to help victims of the Fuego Volcano eruption in Guatemala. In addition, it invited Starbucks customers in the U.S. to join the effort by donating to CARE via the Starbucks mobile app. In order to support long-term rebuilding efforts, Starbucks also announced it will be donating healthy coffee trees to farmers impacted by the volcano in the Antigua region. World Vision is delivering humanitarian aid, including water, hygiene supplies, clothing, medicine, and psychosocial help to evacuees. In addition, it plans to establish Child-Friendly Spaces, where children of evacuees can play and feel safe. World Vision has also distributed 30,000 boxes of medical supplies to shelters in Escuintla, Alotenango, and Yepocapa, including nebulizers for treating respiratory injuries from ash and gases. More than 1,000 hygiene kits will also be delivered soon.